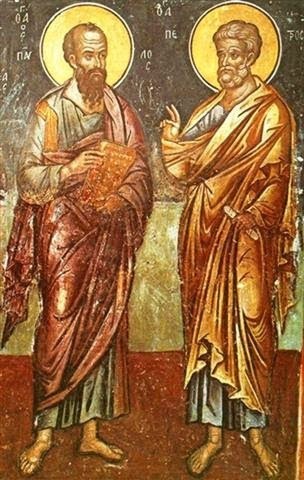 St. Paul's story is certainly a well known one amongst Christians, so I'll summarize the key details and try to hunt down a few tidbits that aren't necessarily common knowledge. We know that Paul was originally named Saul, and that he wasn't a Christian. In fact, he was very anti-Christian and had a dramatic conversion experience on his way to Damascus (heading down for some good old fashioned persecution :)) in which he saw the risen Christ. Known as the "Apostle of the Gentiles," Paul traveled around the Mediterranean bringing the Good News to those who did not yet know God. His letters of encouragement to new Christian communities make up a good portion of the New Testament, and we know that he spent a decent amount of time in prison, poor guy. His post-conversion life was not an easy one, to be sure. Around the year 64, tradition holds that he was beheaded in Rome. "...Imitate that dear Paul, who was so in love, and be a vessel of affection that bears and proclaims the name of Jesus. It seems to me that Paul gazed into this eye and lost himself in it. And he was granted such a great soul that he was willing and even desired to be separated from God, an outcast, for the sake of his brothers and sisters. Paul was in love with whatever God was in love with. He saw that charity is never scandalized, is never confounded." It seems clear to me that St. Paul fell in love with Our Lord, and that love took over his entire life, changing it dramatically from what he had known before. I very much relate to this because although not nearly as dramatic (or vision filled :)) my experience as a young adult coming back to my faith and making it my own bears some similarity. My life had been in a rut. I was unhappy and making poor choices. My faith life was nonexistent. There were little threads there that would lead to something later (like my then-atheist friend Irena wanting me to go to Mass with her; she's Catholic now, btw :0 *angels sing*) but I didn't realize it. Yet one day my heart felt...something. All of a sudden I wanted to read Catholic books. So I did, and I remember the night I started reading the first one I had picked up from a massive sweep of the religions section of Barnes & Noble - I started crying. The book was about Marian apparitions, and that topic is very dear to my heart given that as a teenager I attended a weekly prayer group centered around Our Lady of Medjugorje (not an approved apparition, I know, but the fruits were good in this instance). A wave of nostalgia came over me, and something quite literally burned in my heart. I wanted to go back to having a relationship with Our Lord, and His mother led the way. Then the next day I went to daily Mass like I detailed in the linked post at the beginning of this paragraph, and the rest is history. But the whole thing happened quite quickly and felt sudden. People noticed and wondered what happened that I was suddenly "so religious." I wonder if St. Paul felt the same way as I did. You're just going about your business, leading your sinful little life :0 when WHAM! You fall head over heels in love with God and all you want to do is serve Him. It's all so wonderful and thrilling, but there are challenges too. Thankfully mine didn't involve imprisonment or beheading, but you know what I mean. Your life is forever changed, and you don't mind a bit, in fact are everlastingly grateful, even with all of this crappy stuff happens to you. It's so worth it. St. Paul is a kindred spirit - I think he is interceding for all of us to fall more deeply in love with Our Lord as we journey about the road of life. Don't you think so? Do you have a devotion to St. Paul? Oh squeal! I love this stuff. :) I love being Catholic. Thank you all for putting up with me and reading the chatty nonsense that I write. :) Have a wonderful day!